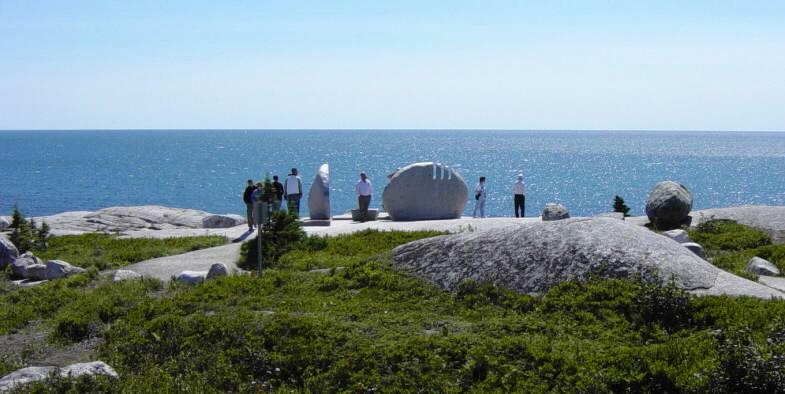 Swissair Flight 111 memorial, Whalesback. Looking southwest toward the crash site. 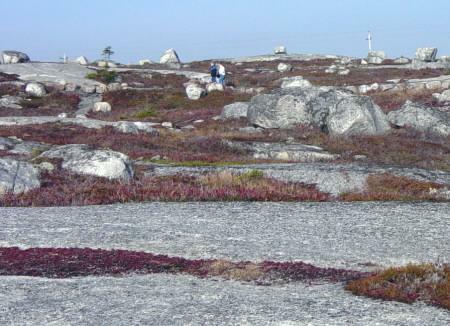 looking southeast toward Peggy's Cove lighthouse. and Bayswater in Lunenburg County. The path to the memorial. 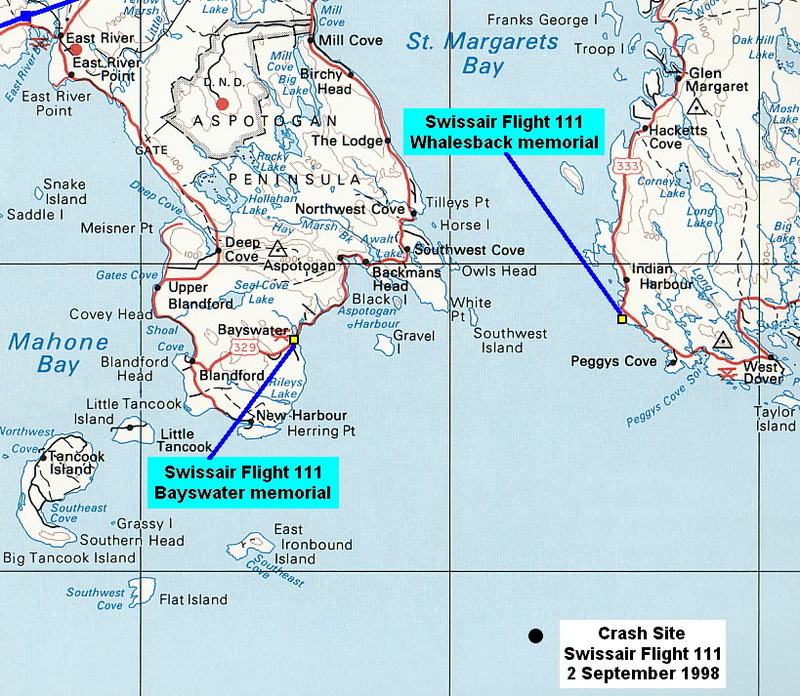 Halifax, 5 September 1998 9:30am: Jeffrey Katz: "An emotional day for all concerned"
Jul 23, 1999 — It was announced July 22 that memorials for the 229 people who died in the crash of Swissair Flight 111 in the Atlantic off Peggy's Cove, Nova Scotia, Canada in September 1998 will bear the airline's name and flight number. The memorials will be unveiled on the first anniversary of the crash. 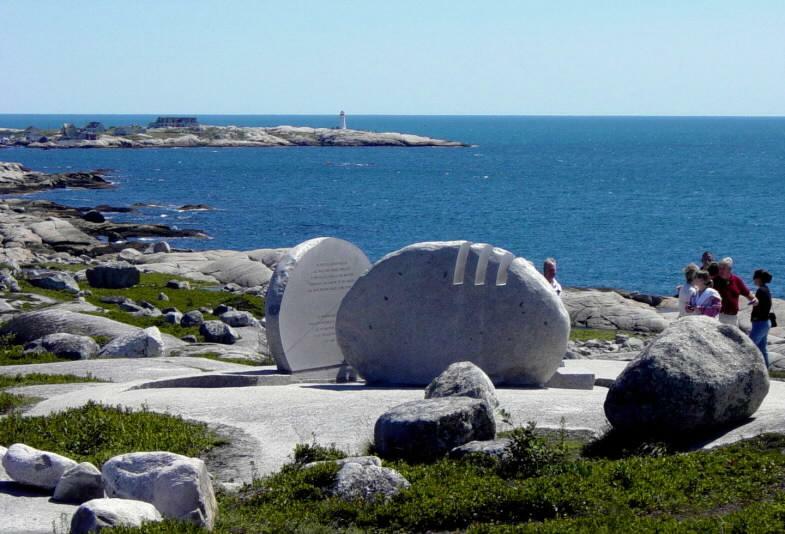 "In memory of the 229 men, women and children aboard Swissair Flight 111 who perished off these shores September 2, 1998. They have been joined to the sea and the sky. May they rest in peace. In grateful recognition of all those who worked tirelessly to provide assistance in the recovery operations and comfort to the families and their friends during a time of distress." 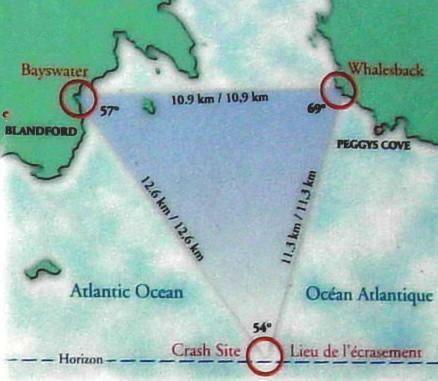 The memorials and a marker on navigation maps pinpointing the crash site itself will form a triangle that faces directly out to where the plane went down. At one site in the beach-side community of Bayswater, a stone wall will list most of the names of Flight 111's crew and passengers. Three family members have asked that their relatives' names be left off the memorials. About 29 coffins of unidentified human remains will also be buried there in a mass grave. 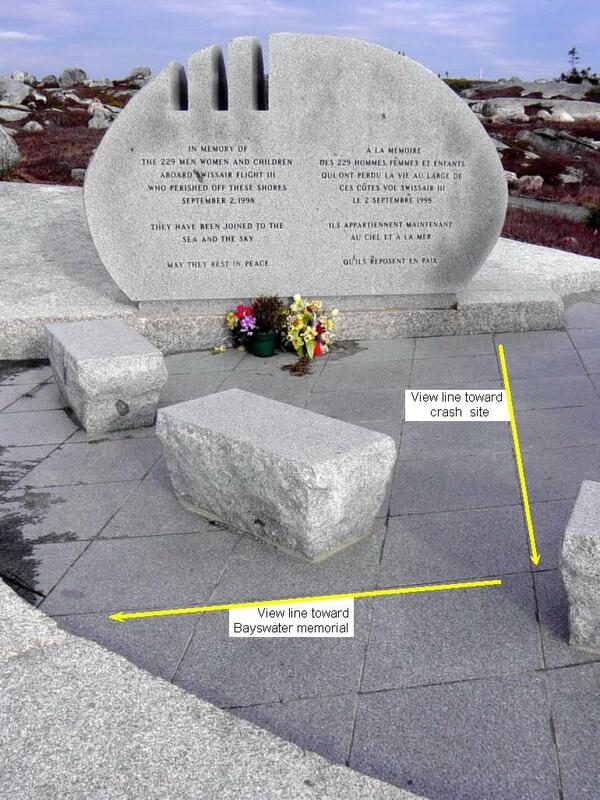 Benches and a monument made out of a boulder will be erected at the other site in Whalesback, a rocky outstretch of land near Peggy's Cove, where grieving families flocked after the crash. 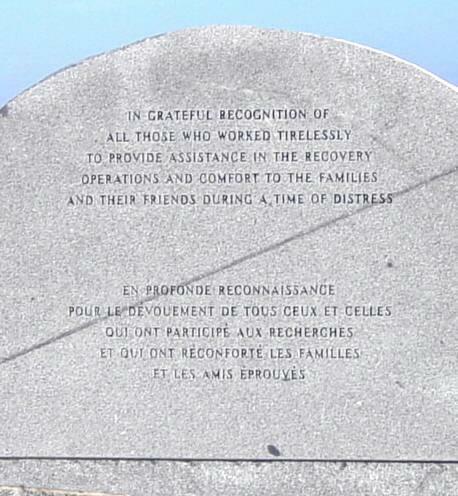 Both sites will include memorials bearing the text that will be in English and French. "People wanted to have memorials that are modest," said Lorne Clarke, head of the memorial committee. "The memorial wording keeps with this concept while remaining honest with historical fact." The issue of what to include on crash memorials has become an issue in recent years, with some airlines being accused of trying to deflect negative publicity by leaving their names off monuments. The Valujet memorial, established after a plane for the discount airline crashed into a Florida swamp in 1996 killing more than 100 people, doesn't mention the carrier's name. A memorial for the victims of TWA Flight 800 in New York also doesn't mention the airline, but states it is in memory of the people "who perished aboard flight 800."